Want to learn more about membership? Click here. The 567 Center for Renewal opened its doors in downtown Macon in 2010. In just 9 years, The 567 has grown into a space that offers unique programming for many different segments of our community. The heartbeat of The 567 is its art gallery, a creative space where anyone can try their hand at creating art, students and professional artists display their work, and entrepreneurs find resources to succeed. Other events that we've hosted in our 9 years include Macon Film Festival, the Bragg Jam music festival, Lost Keys Literary Festival, GABBA Fest (presented by the Georgia Allman Brothers Band Association), and Groove Speak (a night of music & spoken word). All of these activities support the growing creative community of downtown and bring in visitors to downtown from all over Middle Georgia. The heart of what do is the arts because art is a powerful vehicle for growth. Arts events and experiences have the power to create jobs, attract tourism dollars, and give people a stronger connection to Macon. We continue to look for new ways to serve our community every year, and this year is no different. Our pottery studio, which just kicked off last year, continues to grow, and this year’s summer camps will include our very first clay camp. Thanks to a Downtown Challenge grant, we’re adding three new graffiti and mural walls to downtown Macon’s alleys. In March, we offered a free workshop for emerging artists to learn how to sell their artwork through local galleries, and in April we’ll host a free lecture on art collecting. 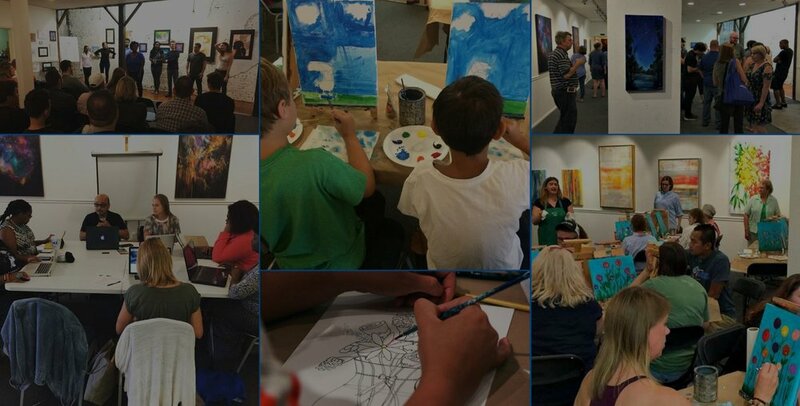 Whether you have previously donated your funds or your time, or attended one of our many workshops, exhibits, and other events, you are a part of making The 567 a vibrant part of our community. In the spirit of that same community, we encourage you to consider making a donation to The 567 to help us continue to bring creative life to downtown Macon in the coming year. Donations are needed to help facilitate the continued renovation of our new space, attract and retain talented staff to carry out our mission, and maintain the financial stability of our organization.